While following the instructions for creating poolish I encountered some problems. The first step is to add 1/3 of 1/8 teaspoon active dry yeast to 47g cold tap water. Then whisk the two together for 30 seconds and look for bubbles. If you see no bubbles or the yeast floats, you have dead yeast. I tried this technique with new fleischmann's active dry yeast as well as red star active dry yeast and neither one bubbled really at all. The only bubbles I saw were maybe a half dozen DURING the brisk whisking. Once I was done with the whisk, no bubbles to be found. I find it odd that two separate commercial yeasts could possibly be dead so I must be doing it wrong. I looked online for videos on proofing yeast and they all seem to note that you should use warm water and also sugar(neither of which this recipe calls for). Help? 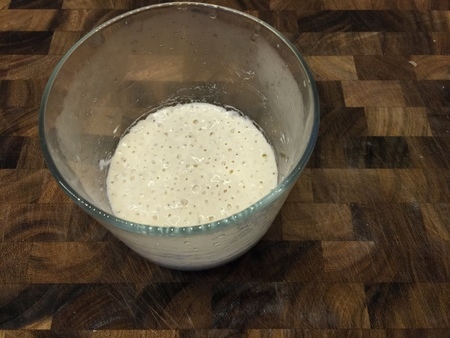 Good news - After I originally posted this question yesterday, I went ahead and just made the poolish to see how it would turn out. Even without any bubbles, the Active Dry Yeast(ADY) seemed to grow as expected. I''m not sure exactly why, but in my conditions it just doesn't seem to bubble. This might help others who try this in the future I hope. Cheers! I just made this poolish for the first time a few days ago.....1/3 of 1/8 tsp of yeast is not very much yeast at all....when I first made it, I look at the yeast on top of the water and said this is not going to work.....but it sure did.....when I whisk it, I did not get the bubles I was looking for....there were a few.....I used the poolish for my Sicilian pizza, which added a lot of flavor to the dough..